This free version Includes a sampling of items for building the most delicious, real or wacky ice cream sundaes! Build the ultimate ice cream sundaes from a huge selection of ingredients! * Pick your cone, special ice cream dish or bowl! * Select your scoop of Ice Cream, scoop after scoop of flavors! * Add the syrups! One for each scoop or layer after layer of sweets! * Next cover your creation with Candy Toppings, Fruit Toppings, Chopped Nuts or more! * Add on Goodies and Candies, place as many as you want, anywhere you want! * Finally add extra decorations to make your sundae extra special! * Pick your favorite background setting for eating your sundae! * Then, eat your sundae! * Or, email it to a friend! * Or Save it in the freezer to show off or eat later! 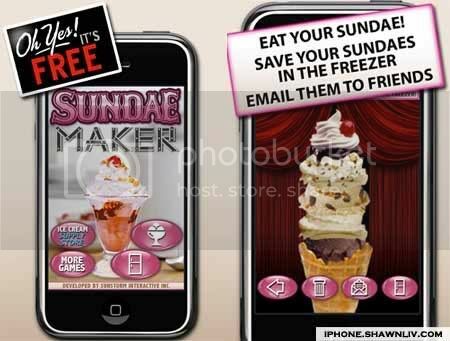 This FREE version of Sundae Maker includes a small sampling of sundae making items. We have included hundreds of sundae making items as part of our expansion packs. Go to the Supply Store inside Sundae Maker to purchase one of the expansion packs to INSTANTLY gain access to the new items! A huge freezer full of all your favorite ice cream flavors and syrup toppings! More than 60 new flavors of ice cream and syrup for endless variety! Cover your Sundae in toppings and place goodies for the perfect combinations! Just a few of the items include: Chewy Bears and Worms, Sprinkles, Whip Cream, Nuts, Candy coated Chocolate, Fruit Chew candy and fruit toppings! More the 50 new items! Everything you need to make your Sundaes EXTRA special! Build a Banana Split? a Happy Birthday Ice Cream Sundae? Some of whats included: Waffles, Cones, Bananas, Flowers, Candles, Cookies, Brownies, Sports Toppers, Sparklers and more! Have fun placing these gross bugs, eyes, worms, and other creepy crawlys all over your Sundae creation! Build the wackiest Sundae you can imagine… Alien Sundae, Princess Sundae, Mad Scientist?, Dinosaur Ice Cream? Dozens of Neon and Glowing Ice Cream flavors, and strangely sweet syrups.